a commitment to compliance with our ISO-9001 Quality System. Quality Chaser Company is pleased to announce an agreement to represent Firth Brown Tools. Firth Brown has been manufacturing exceptional tooling in Cambridge, Ontario since 1921. Their tools are designed and engineered on-site under ISO 9001 quality certification guidelines. Primary products of the Firth Brown Company are solid high-speed steel pipe taps, nib taps, bent shank and spiral point taps. A variety of premium material options and surface treatments are also available. These special taps are used in applications such as automotive, lead-free brass valves and fittings, pipe and fastener couplings, construction grade nuts and other demanding applications where high production and superior performance are required. Contact our Customer Service for quoting requirements and details. Visit the E-Mail page and request your free copy today. You can also download a copy right now from the Download page. Quality Chaser offers Oster style dies in a broad range of symbols and sizes. Further information can be found on the Oster page, or get a copy of our Oster Product Guide in .pdf format from the Download page. ... or just give us a call. Hollow milling with QualityTM tooling in Geometric, Cleveland or Landis die heads provides an efficient, rapid and economical method of performing turning, forming, pointing and chamfering operations. Die heads lend themselves to the hollow milling operation and, depending on the style of head, are readily adaptable to automatic screw machines, turret lathes and leadscrew threading machines. Positive feed is required because, unlike threading chasers, these cutters do not produce "nut action". Hollow milling can only be performed on equipment with positive or mechanical feeds, (i.e.) leadscrew, hydraulic or cam feed. 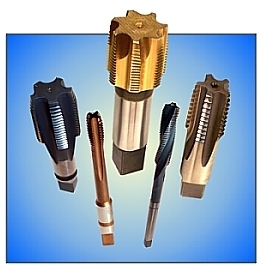 The diagram below represents some of our standard milling cutters. If you require something special, please contact our customer service department for assistance.